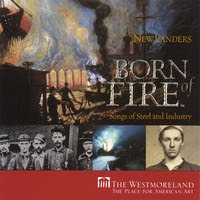 "Born of Fire" is 11 Songs of Steel and Industry collected by Paula Purnell and innovatively arranged by the NewLanders for this project of the Westmoreland Museum of American Art. I should have known that any musical project undertaken by regional treasure Paula Purnell and multi-instrumentalist and engineer extraordinaire Doug Wilkin would be of exceptional quality. In addition to Doug and Paula the NewLanders feature Art Gazdik on mandolin and violins and vocals and Gerard Rohlf on 6 and 12 string guitars. The project is enhanced considerably by the budget provided by several area foundations, enabling the NewLanders to engage the services of a wide variety of talented musicians from around Pittsburgh. In live performance the songs are accompanied by a powerpoint show of paintings from steel and industry assembled by The Westmoreland. This brilliant recording paints pictures of its own. The recording contains some familiar material - Woody Guthrie's "Hard Travelin'" and a delightful arrangement of "Bread and Roses" using Mimi Farina's melody. Deborah Silverstein's classic song about strip mining - "Draglines" - is given respectful treatment. Gerard Rohlf's original about riverboat captain Spike Crain sits nicely in the project. The most noteworthy contribution made by "Born of Fire" is the breathtaking arrangement and performance of many largely unknown songs written at the dawn of Pittsburgh's industrial era. "Twenty-Inch Mill" (c. 1870), "Where the Old Allegheny and Mongahela Flow" (c. 1910), "The Altoona Freight Wreck" (1926), "I Lie in the American Land" (c. 1899), "Two Cent Coal" (c. 1877) and "In Soho on a Saturday Night" (c. 1855) are beautifully revived in this recording. The NewLanders vocal harmonies are flawless. The show-stealer in my opinion is "Coal Diggin Blues," collected by George Korson in 1940, but sung by African-American coal miners as early as 1840. A must for any union member's record collection - and a much more authentic expression of true Pittsburgh than overpriced sweatshop-made sports items. Available at CDBaby ... and while you're there, buy "Where the Allegheny Flows." Moving Day - April 21 and April 22!!! I had a great time canoeing on the Hillsborough River near Tampa with my friends Phil and Rhonda Cohen, Phil Keyes and Jodi Bikoff, Phil's sister Denise Garrott, and Phil's spirit-goddaughter Savannah... Phil Keyes took these fabulous pictures.